Overcome the obstacles that are preventing your business from getting thorough cleaning with help from Flue Steam. Keeping your kitchen exhaust system clean isn’t just the law—it also provides many important benefits for your business. Unfortunately, some commercial kitchens don’t get the thorough cleaning they actually need. There may be many different reasons for this, but here are 4 common possibilities. First of all, some commercial kitchen owners or operators may simply fail to order the thorough cleaning service needed to remove grease from every inch of the exhaust system. This is more likely to happen in kitchens that don’t cook a large volume of greasy food. Grease then builds up very slowly on visible areas of the exhaust system such as the exhaust hoods, and owners may assume it is building up even slower further inside the system. Because they can’t see this buildup, they may not realize that a problem is indeed growing. Another very common problem is using the wrong exhaust system cleaning company. Many companies are content to just clean the visible parts of the system. They may reach up into the plenum and ducts as well, but they won’t go further than their arms and equipment can reach. Relying on a company that promises your ducts are “clean” without actually providing complete steam cleaning of the entire system is naturally a huge impediment to keeping your ducts grease-free. 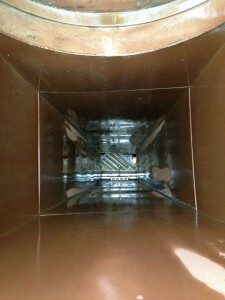 A lack of sufficient access to the ductwork is another serious obstacle to proper cleaning. NFPA codes require that approved access doors be installed in the system at specific intervals. Depending on the design of the ductwork this may mean you need a door that a person can enter through or smaller access panels at pre-set intervals. You should also have a hinge kit on your rooftop exhaust fan to facilitate proper cleaning of that important piece of equipment. Sometimes, kitchen owners may hesitate to order service as frequently as they really need to out of concern about the cost. In reality, the cost of service is very small compared to the possible costs of a fire breaking out in the ductwork. Clean ducts also draw air better, contributing to lower cooling bills and lower gas bills (propane flames on cooking appliances will burn higher with better air flow). Remember, the longer you wait between duct cleanings the more grease will build up and the more difficult—and costly—it will be to remove. At Flue Steam, we can help you overcome all of these obstacles and get the thorough cleanings your business needs. We provide extremely thorough steam cleaning services to reach every corner of your ductwork, even the parts you can’t see. We can measure grease deposits throughout the system to determine the proper frequency of hand scraping and steam cleaning to help you understand when to order service, and we can install code compliant access panels for you. And of course, our services are very cost-effective. Please call now to schedule your service at a time that is convenient for your business.